GM's Tim Mahoney: "We are still in 115 countries around the world, so for me that's rather global." 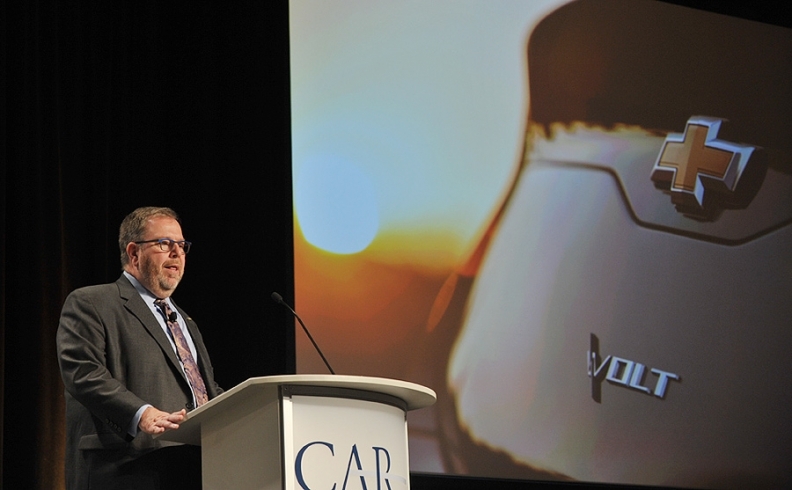 Since taking over as Chevrolet's global chief marketing officer in 2013, Tim Mahoney has steered the brand's "Find New Roads" campaign across the world. But his geographic responsibilities have been shrinking amid General Motors CEO Mary Barra's push to focus on fewer, more profitable markets. In recent months GM announced plans to pull out of India and South Africa, two markets where Chevys are sold. The automaker is also exiting Europe by selling its Opel/ Vauxhall subsidiary to French automaker PSA Group (though Chevy will keep its small presence in Europe, where it sells Camaros and Corvettes). Advertising Age, an affiliate of Automotive News, caught up Mahoney at the recent Cannes Lions International Festival of Creativity to get his take on how GM's new strategy is affecting his job. We also quizzed him about the future of Chevy's controversial Manchester United soccer sponsorship and why the brand recently exported the American Dream to Canada with a campaign that taps into the nation's immigrant-friendly attitude. Below, a lightly edited transcript. As GM's footprint shrinks, do you still see Chevrolet as a global brand? We are still in 115 countries around the world, so for me that's rather global. The company is focusing in areas where it can win. And the areas where it's more challenging we are dialing back and then that frees up resources for us to do other things in new technologies and new business models and things like that. But are you concerned about GM's exit from India, one of the fastest-growing economies in the world? I don't think anyone ever wants to retreat from anywhere. But I think it's a smart decision. The volume there was under 30,000 in a country of 1.1 billion-plus people. Things aren't always forever, and I'm not saying that we would go back. But we've been there 20 years and the company took a look at it and decided to leave. It's going well. The interesting thing about Chevrolet is that while it's 105 years old, like any brand its footprint, its history really is different all over the world. We just celebrated about a year ago a tenth anniversary in China. We are five years in, six years in, in Korea. When my predecessor was looking for a sports platform that would work around the world, football [soccer] for sure was it. And in markets like China where you have over 100 million Manchester United fans alone, being associated with a premium brand like that was a quick way to build awareness. What we've seen is lifts in consideration, lifts in opinion of the brand. And so from that perspective I think it's working. But is it worth $600 million, the originally reported pricetag? It's hard to say. One thing that I think is smart is there is a commitment long term to do it. And if you are going invest in it you have to do it for a long time. When does the deal expire? It's too early to say. But the Chinese like it. What is the broader challenge for Chevy in China? That challenge in China is the market continues to grow but we are a newer brand. And so you have aggressive local brands getting stronger and stronger, and you have the joint venture import brands. So we are trying to stake out a place where Chevrolet makes sense. You are planning a new campaign in China. Can you give details? The thing that the Chinese admire about America is the sense of freedom and anything possible. So bringing that to bear across the brand is what we are working on. The U.S. market has been running the "Real People, Not Actors" campaign. How do you evaluate where else in the world where this might work? It's particularly powerful where people know the brand but may not have thought about it in a while. We have been in the Middle East for a long time, so we have "Real People, Not Actors" in Dubai, and it works there. Talk about your new "Canadian Dream" campaign that is running in Canada. The Canadian Dream is about anything is possible to find a new road. If you go to Toronto, half the people there weren't born there. So it's tapping into that cultural phenomenon. The dream idea is one that has traditionally been associated with the American Dream. What made you take this to Canada? There is a great article you should check out in Maclean's, which is one of the business publications up there, and it talks about, has the American dream moved north of the border? And there is a sense up there of inclusion and possibilities. Huge immigrant populations from Asia, South Asia, Middle East. And so it in some ways it is a little bit like the U.S was a long time ago. Do you think the American Dream still exists? Oh, I think so. Oh, absolutely it does. But I think it's interesting that they've been able to capitalize on it. Auto sales are slowing. How will this change your marketing approach? The tendency is when things get tougher to lean into more rational reasons to buy. I think the smarter way is to lean into more emotional reasons. Because if you are talking price, which is incredibly important, it is really about value, and somebody will always be lower. Or if you are talking about we have X amount of airbags, somebody is always going to have one more. You have to start the conversation at a human level and I think that also helps you connect with people a little bit better and get you through tougher times. How much has the automotive industry changed with the rise of autonomous technology, car-sharing and the like? I remember when I was younger, getting a car and getting a license was freedom. It was independence. Nowadays as these new business models come into play and also with mobile, your mobile device is a lot like freedom. You can stay connected to friends through a lot of the platforms. And as it relates to the actual physical mobility as opposed to this kind of virtual mobility, you have choices you never had before and mobile has sort of enabled that. You couldn't go to a phone booth and call up and say where is the nearest Lyft car. This whole spectrum of -- I own it, I lease it, I rent it, I share a car, I share the ride -- there is a whole bunch more choice that is available. And I think we have to think about transportation and personal mobility rather than just cars. The company is pretty well positioned in the investments we've made in Lyft. And, we'll see. But Chevy made its name by selling to people in an ownership society. Isn't it harder for your brand to operate in the sharing economy? I don't know. I think it makes it more interesting. I'm actually in a Cruze RS hatchback. I try to drive everything really. I had a Silverado crew cab which I loved, but living in downtown Detroit it was a challenge to park. And before that I had a Volt. I'm actually more of a car person than crossovers or SUVs.